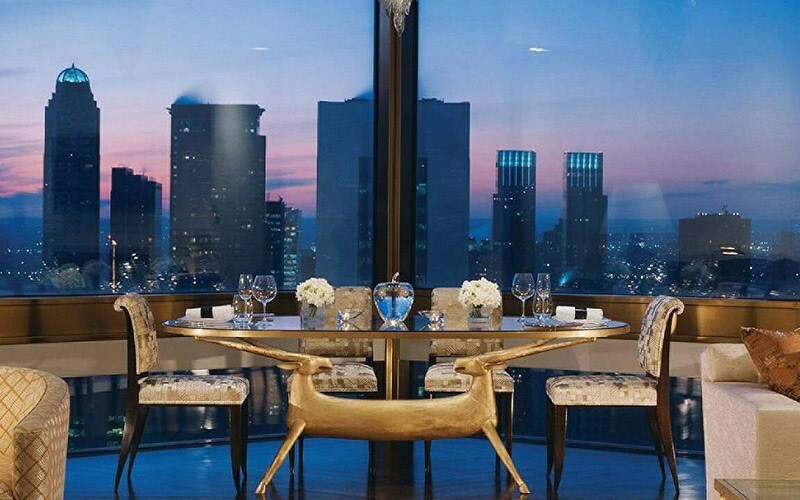 The highest hotel suite in a city known for its legendary skyscrapers, the opulent, one-of-a-kind Ty Warner Penthouse suite in New York soars 800 feet (244 metres) above the street. Created by visionary architects I. M. Pei and Peter Marino, the suite was seven years and USD 50 million in the making and offers incredible 360-degree views. Located on the top two levels, these residences offer a luxurious sense of space along with spectacular views. Choose your preferred vantage point from the various sitting rooms, private pavilions, and penthouse terrace – each with its own vista of the Resort’s tropical gardens, the lush countryside or the mist-clad hills in the distance. The penthouse bedroom enjoys complete privacy, while all three sumptuous master bedrooms come with their very own Jacuzzis. The central dining and living areas offer the perfect space to enjoy collective feasts and merrymaking, with plenty of natural light. The interiors are fitted with all modern amenities and decorated with thoughtfully chosen pieces of Thai craftsmanship – a fine balance of comfort and culture. Each residence comes with its own kitchen and housekeeper. For those who demand the very best, the Penthouse Suite at Beverly Wilshire, Beverly Hills (A Four Seasons Hotel) is the most impressive hotel suite in Los Angeles. Located on the private, key-accessed 14th floor of the Beverly Wing, this three-bedroom suite offers 5,000 sq. ft. (465 m2) with panoramic views from the spacious terrace. Ideal for entertaining, there’s a media room, plus a dining table for 10 with an adjoining show kitchen. The master bedroom includes an expansive walk-in closet and an ensuite bathroom with sleek glass tiles, exotic stones and marble, an oversized shower and a deep-soaking tub. This is truly the ultimate Beverly Hills luxury hotel accommodation. An elegant choice for relaxation or business, the Penthouse Suite offers private access and views of central Milan and the Duomo. Combine it with a Premium Room and an Executive Suite and all three will be connected by an internal, private staircase. Elegant, welcoming and completely memorable, The Penthouse imparts the sense of staying in a private Parisian residence. The Penthouse features luxurious finishes and furnishings, sumptuous amenities, and breathtaking views of the City of Light, including the Eiffel Tower from your own private terraces. The luxury Presidential Suite in Four Seasons Hotel Sydney features two spacious bedrooms and stunning views of Sydney Harbour from the Hotel’s top floor. Modern art is displayed in the lounge room, which occupies the entire northeast corner of the suite. Guests in this suite enjoy Executive Club access for two adults, including hot buffet breakfast daily, complimentary Internet, all-day refreshments, garment pressing, business services and much more. Known as the “Palace in the Sky,” the luxurious 730-square-metre (7,857-square-foot) Imperial Suite, one of the largest in the city, takes up our entire 27th floor of our luxury hotel in Beijing. Styled to give the impression of a chic art gallery, the suite delights the senses with high-quality furnishings, finishes and technology.